You can NEVER have too many towels. 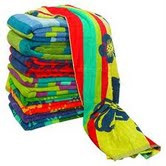 Order our Beach Towel packages for great convenience when heading to the beach. No need to bring your towels from your Rental Unit, save those for the shower! Lay in the sun, relax, shake off the sand and you’re good to go! Beach mats are a more sturdy, easier way to lay out option compared to the beach towel.